Settlement starts out with one unusual claim to fame — it is translated by an American, at a time when most translations of German literature come from European sources. As well, it has another claim — it is a novel that explores some of the difficulties which followed the end of World War II, through the Soviet occupation of East Germany and finally the collapse of the Berlin Wall and the 1989 breakdown of the Soviet Empire. Bernhard spoke very little, and he was very stubborn, but he was also easily influenced, if you knew how. There was something mule-like about him — a stubborn beast that wouldn’t respond to words or whips, but then, after you’d given up, would suddenly take off in the desired direction, because it had finally dawned on him what was wanted. When I told him something, he first had to chew on it and digest it throughly before it sank into his head. He was a little slow on the uptake, and mistrustful, just like his father and the rest of the family, and they all did these strange things with their eyes when you spoke to them. They didn’t completely squint, they just narrowed their eyes as if they were anxiously awaiting what might come next. Maybe that was normal where they came from. Maybe everyone there was mistrustful, or maybe they had lived through terrible things and were afraid they might happen again in our town. His one true friend was his dog, a young mixed-breed terrier farmer Griesel had given him as payment for a week’s field work, which he gave the unusual name of Tinz. He even tried to bring the dog to school. When the bell rang he tied the terrier to the school’s low picket fence and told the dog to sit down and wait. The dog sat and looked at Bernhard attentively. “Sit and no barking,” Bernhard said. Then he went inside, turning around several times to make sure that Tinz was doing as he’d been told and keeping quiet. During our first lesson the custodian came to our classroom and, after consulting with the teacher, asked Bernhard whether the dog in the yard belonged to him. When Bernhard gave a silent nod, the custodian said that bringing animals to school was against regulations, that it was cruel and a public nuisance and he didn’t want to lay eyes on the beast in his schoolyard ever again. For Bernhard (and his family), there is always a regulation. Stubborn lad that he is, he continues to bring the dog to school until finally he is threatened with expulsion. Eventually, Tinz is murdered and his body left to rot. It marks the start of Bernhard developing a more agressive response to the discrimination that he faces. He never retaliates directly, but he does retaliate. And along the way he spots and siezes opportunities that allow him to create his own place in the world. His path to success is not a direct one, but it is one he understands. He remains an outcast even as East Germany descends into the chaos that will eventually end with the collapse of the Berlin Wall — at this point Bernhard’s well-honed coping skills stand him in good stead as he is more used to dealing with uncertainty than most of his neighbors. As I hope the quotes illustrate, there is a flatness to Hein’s prose style that suits his story well. His central character is not an emotional person — as the story goes on there is more inevitability than there is dramatic catharsis. It is accomplished very effectively. There is no doubt that the dislocation of post-war Germany created many examples of stories like Bernhard’s. 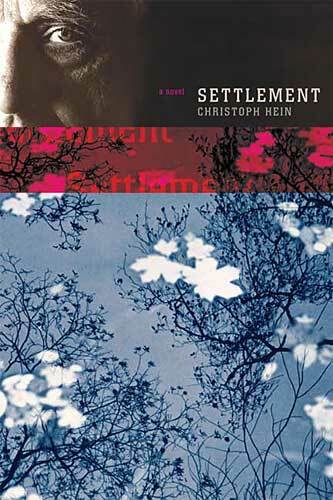 Settlement is not a long novel but the ambiguity implied in the title is maintained throughout the book. The result is a very significant book which I am pleased to recommend. I don’t read as many European works in translation as many other bloggers do — I am very happy that I read this one.